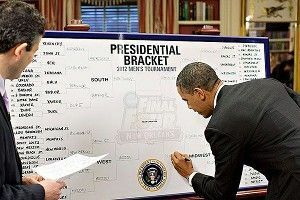 President Barack Obama picked his official March Madness bracket, putting Kentucky, Ohio State, North Carolina, and Missouri in the Final Four, with the Tar Heels winning the championship. At least that’s what ESPN is reporting; according to several Republican sources, Obama actually picked a Final Four of Harvard, Duke, Kim Jong-un, and the Nairobi Fake Birth Certificate Corporation, with Duke winning it all. In the First Four in Dayton, South Florida took the fight to Cal early, running up a big lead and winning 65-54. That leaves just one team from the Pac-12 in the tournament, but conference officials are confident that Colorado will restore their honor by winning the national title. The University of Vermont Catamounts, from lovely Burlington, Vermont, on the pristine shores of Lake Champlain, also advanced to the field of 64 with a 71-59 First Four win over Lamar. According to a hateful rumor, more cows than people cheered when they heard the result. Mike D’Antoni has stepped down as coach of the New York Knicks after reports emerged that he couldn’t control his team. And look, no disrespect to D’Antoni, but this is what happens when you don’t discipline your players. Maybe he’s one of those hippie coaches who wants to be his players’ best friend, and thinks spanking is “evil,” but guess what? My coach always spanked me, and today I thank him for it, believe me. I watch Carmelo Anthony pouting and whining on the court, and I just think, you know, it didn’t have to be that way. He’s not a bad kid. But Mike D’Antoni did him a huge injustice by letting him get away with murder. He should have set limits, and yeah, he should have spanked Carmelo Anthony. Peyton Manning spent eight hours with the Tennessee Titans on Wednesday, reportedly discussing his possible future with the team. Bizarrely, team officials reported that at least six hours of the meeting consisted of Manning questioning them on the mythology of the Titan, and how a Titan would fare in a one-on-one fight with other gods, Greek and otherwise. Receiver Calvin Johnson signed an eight-year extension worth up to $132 million with the Detroit Lions. All my instincts tell me to take a shot at Detroit here, but in the time you spend reading this joke, there will be four shots fired in Detroit anyway, so what’s the point?